They represent shoe accessories of the very highest quality. Products from all of the sophisticated brands mentioned here are available in the shoe accessory section of our shop. We selected them for you after long and careful research. This traditional Swiss company with a mountain in its logo represents the highest quality. Exquisite shoe polishes and brushes from the leading French shoe care brand, based in Paris. Solitaire has been producing premium shoe care products for over 80 years. Shoeboys is a premium German shoe accessories manufacturer. SWIMS, a Norwegian company, has revived an old classic: galoshes! It has made them chic, to boot. This English company boasts over 250 years of experience in working with horn. A brand of the century. Nico creates shoe trees ‘made in Germany’. Founded in 1905, Heute numbers among today’s leading providers of shoe polishing machines. Alvoro Design offers sophisticated storage options for shoes and shoe care products. A successful full-service provider of shoe accessories and care products, based in the Hessian city of Weiterstadt. From the heart of the coal industry in Rohr to the pinnacle of Germany’s finest shoe accessory brands. Those seeking a tried and tested leather shoe dye should reach for Morello. Saicara’s luscious products pamper, refresh, revive and relax your skin. This family-owned German company manufactures cedar insoles to keep shoes fresh and feet healthy. There are many manufacturers on the shoe accessory market, but only a select few offer truly excellent products at reasonable prices. From full-service providers of shoe accessories and products to specialists focused upon a single type of product, the brands represented in our selection of shoe accessories all stand for premium quality. Shoeboys, on the other hand, has not limited itself to one type of product. This Mainz-based company has made a name for itself as a full-service provider of shoe care products and accessories. In addition to shoe care products, Shoeboys also produces insoles, footbeds, shoe laces, shoe trees and accessories in its proprietary German factories. Finely attuned to the needs of its customers, this company creates high-quality, innovative products for shoe owners. Despite their high quality, Shoeboys products are available at surprisingly affordable prices. From specialists to full-service providers, all of the brands represented in our shoe accessories selection make their products with love, a passionate level of attention that is clearly reflected in the stunning end results. 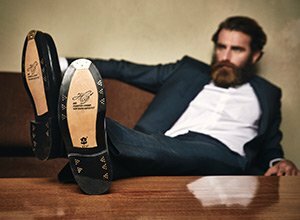 We are happy to have found the perfect selection of brand-name manufacturers, offering you the absolute finest in shoe care products.